You may try it out without buying first. Simply download it. If you keep using it you are expected to pay for it, though. Fixes "Name equals" on APFS volumes. Applications can be chosen again with "Pass Results". Improves performance with file icons in "Preview Grid" mode. Critical fix for searching APFS disks. Text search (only plain, unformatted text). See complete list of changes. Compatible with El Capitan and Sierra. Path and folder exclusion options. Much faster on network volumes (Windows Shares, NAS). Does not show the .faf files from previous searches any more. "Open Recent" menu to re-open previously performed searches. Pressing Option or Command key while clicking "Add Choice" adds a new choice immediately. Restores columns in Results window if they got misaligned. Corrected french text "Traitement des données". Fixed search for Creator and FileType codes. Lots of new search criteria (words, wildcards, labels). Improved filtering (show only invisibles, hide trash). You can now change the labels of selected items. Many bug fixes (e.g. no more long startup delays for some users). Concerned about Apple's upcoming 64 bit requirement? Worry not. While macOS reminds you that FAF will need to be updated for 64 bit, the current FAF version will still work in macOS 10.13 and 10.14. I have started a complete rewrite of FAF that will not only address the 64 bit requirement but also make other features more easy to add in the future, such as: Optional single-window interface, immediate listing of results, scripting. If you like to start trying the new version 2 as soon as it's available, check the options Automatically check for updates and Include Beta & Preview versions in FAF's Preferences window (you need to use the FAF version downloaded from here, not the one from the Mac App Store to find this option). Have you purchased FAF in the Mac App Store? If you have purchased FAF in the App Store, you can download and use the version from this website just the same, and you do not have to purchase it again. Contrary to Spotlight, it does not use a database but instead uses the file system driver's fast search operations, where available. This lets you search for file properties such as name, dates, size, etc., but not for file content (for content search, Spotlight is the better choice, usually). Find Any File can find files that Spotlight doesn't, e.g. 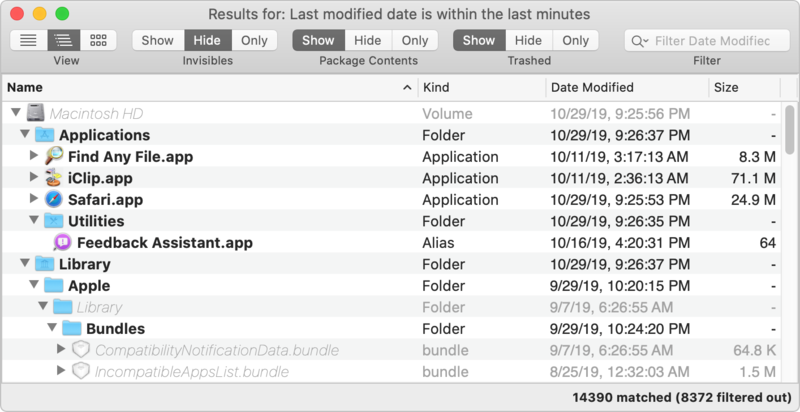 those inside bundles and packages and in inside folders that are usually excluded from Spotlight search. Finally, it is quite fast. 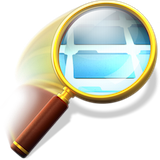 A search only takes a few seconds on a disk in HFS+ format (Mac OS Extended). Sadly, though, disks formatted in the newer APFS format will not search as fast any more (that's Apple's fault, and FAF can't do anything about that). If you search for content, such as in PDFs, Word documents etc., use Spotlight. If you search for files by name, size or date, use FAF, as only then you can be sure that everything available is found. Note that the search above revealed hundreds of hits. If you&apos;d look at that many results in a flat list, it would be hard to browse. With this new hierarchical view, however, you can directly look for the results in the folders that interest you. Find everything on your disk: If you hold the Option key (alt) down in the Find window, the Find button turns into Find All. If you click on it then, you are asked for an administrator password - and then Find Any File will restart in root mode, being able to find really any file on your Mac&apos;s volumes, including files in other users' home directories (something that Spotlight won&apos;t do). Note that this will only work on local disks, not on network mounts, though. You can save your entered searches to files (they&apos;ll have the extension ".faf"). 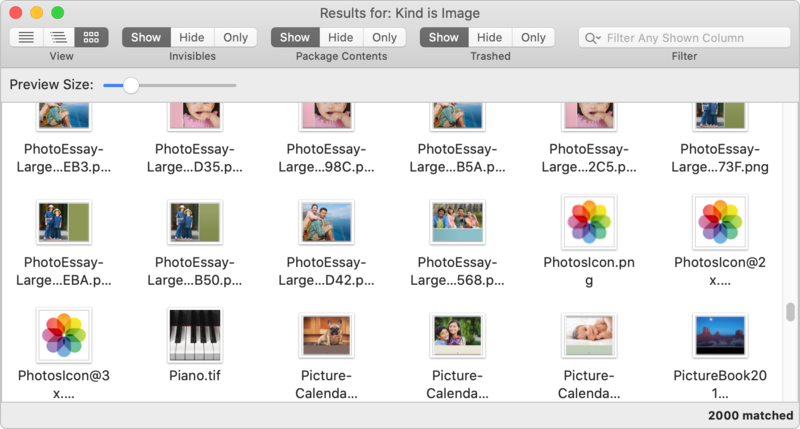 You can then double click them in the Finder to have them start the search immediately, or use the saved search as a preset. To learn more about Find Any File's many features, see the manual. If you like to search for data inside files, and Spotlight doesn't do it for you, have a look at EasyFind by DEVONtechnologies. It offers a few extra search options (e.g. wildcards), displays results a bit neater and has a single-window user interface which you might prefer. However, note that it has troubles with APFS volumes (Apple's new disk format since macOS High Sierra). And if you want to search for specific text in a large set of files inside a directory, try BBEdit. To see which files, applications and folders occupy the most space on your disk (FAF can't search for app sizes, only regular file sizes), consider DaisyDisk.